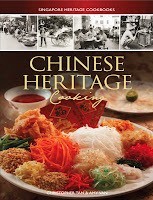 Amy Van and Chris Tan have been so kind as to allow Gastronommy to publish some of the recipes from their book, Chinese Heritage Cooking, for you to try out at home. 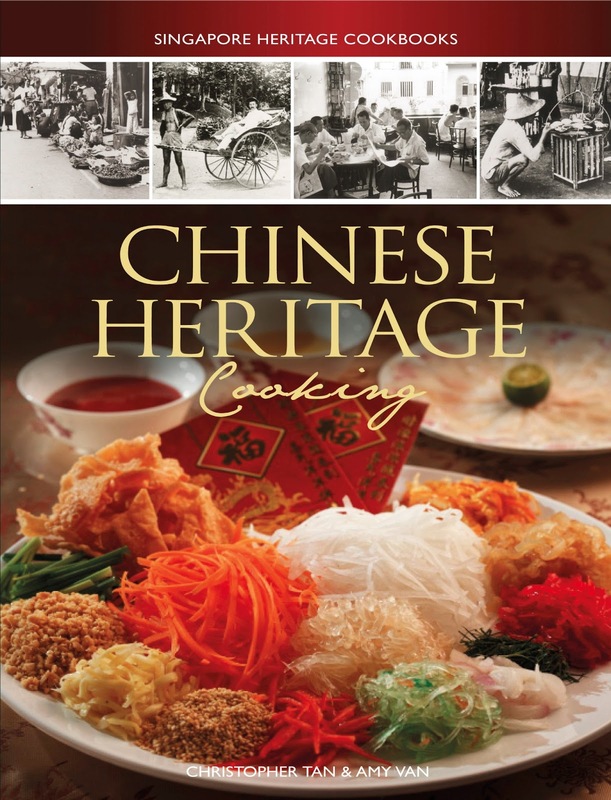 The first to be presented will be Steamed Radish Cake. This is one of my favorite comfort foods, having grown up eating my grandmother's lovingly made tins of it over the years. I'll have to do a side by side comparison of our steamed radish cakes one of these days. Lusciously soft when fresh from the steamer and crispy-crusted when fried up the next day, steamed radish cake is equally good either way. You can substitute some of the coarsely-grated radish with grated pumpkin, sweet potato, carrot or green daikon radish, to add a touch of colour to the steamed cake. 1. Heat oil in a pan over medium heat. Add diced Chinese sausages and stir-fry for 1–2 minutes until fragrant and some of their fat has rendered. Dish out, leaving oil in pan. 2. Add shallots and garlic to pan and stir-fry for 1 minute. Add dried prawns and fry for another 1 minute. Add rice wine and fry until liquid has evaporated. Dish out to plate with Chinese sausages and set aside. 3. Sift rice flour, sago flour and wheat starch or potato starch together into a large mixing bowl. Whisk in water and pepper until smooth. Cover and let stand for 30 minutes. 4. Finely grate half the daikon and coarsely grate the other half. Mix grated daikon with salt. Let stand undisturbed for 20 minutes. Drain water from daikon, then squeeze well to remove excess liquid. Rinse well with fresh water, then squeeze dry again. 5. Combine daikon and rice flour batter in a wok or large pot. Stir constantly over mediumlow heat for 12–15 minutes, until thickened to the consistency of congee; make sure you scrape the bottom and corners of the wok or pot to break up any lumps as you stir. Turn off heat. Stir Chinese sausages and fried dried prawn mixture into paste. 6. Scrape paste into a well-oiled 23-cm (9-in) or 25-cm (10-in) round cake tin. The mixture should not be more than 4-cm (11/2-in) deep. Cover with aluminium foil. 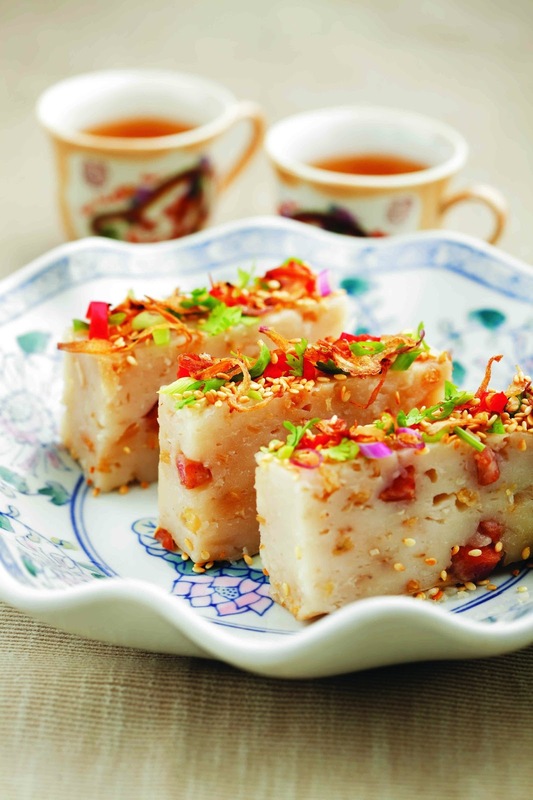 Steam radish cake over high heat for 45–55 minutes, until set and cooked through. Do not over-steam or radish cake will be too soft. 7. Place tin on a wire rack to cool. Slice and serve warm, sprinkled with garnishes. Alternatively, let radish cake cool completely, then cover and chill overnight. Slice chilled cake into slabs and pan-fry with some oil until crispy on all sides. Serve hot with garnishes or chilli sauce. • This recipe can be adapted to make yam cake. Replace the daikon with 300 g (11 oz) peeled taro. Skip step 4 and instead steam the taro until just soft, then break it roughly into chunks and small bits while it is still hot. Stir it into the batter with the sausages and dried prawn mixture in step 5 and proceed with the recipe as above.